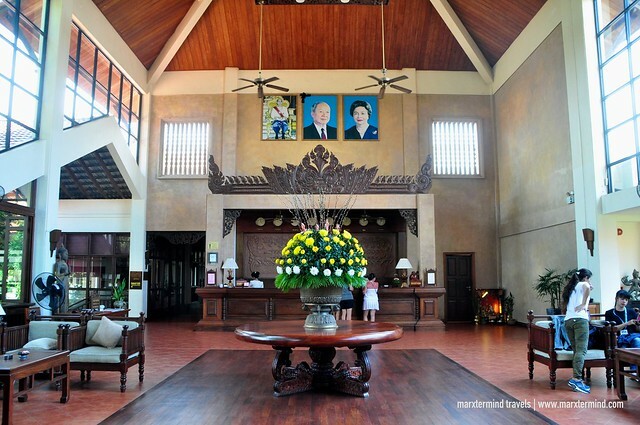 A 5-star luxury resort providing exclusive accommodation and excellent facilities, Angkor Palace Resort & Spa was my home for three nights when I was in Siem Reap. I went back to this famous destination in Cambodia to see the legendary temples again but never thought that this trip would be even more remarkable because of my stay in Angkor Palace Resort & Spa. I was able to admire this resort right away. The time that I arrived at the resort, I instantly felt the warmth, comfort and elegance of this property. I took a direct flight from Manila to get to Siem Reap. 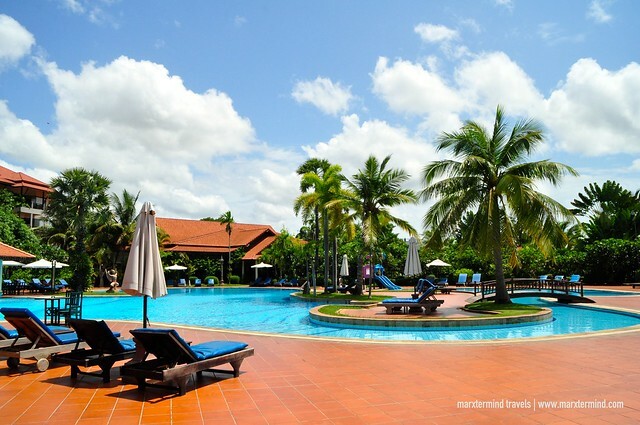 I was provided with a free airport transfer so getting to the resort had become very convenient for me. Checking in was smooth and easy. I was asked for my passport. And while waiting for my reservation to be confirmed I was provided with a refreshing welcome drink. Few minutes after, the staff handed me my key card. A bellboy then accompanied me to get to my room. 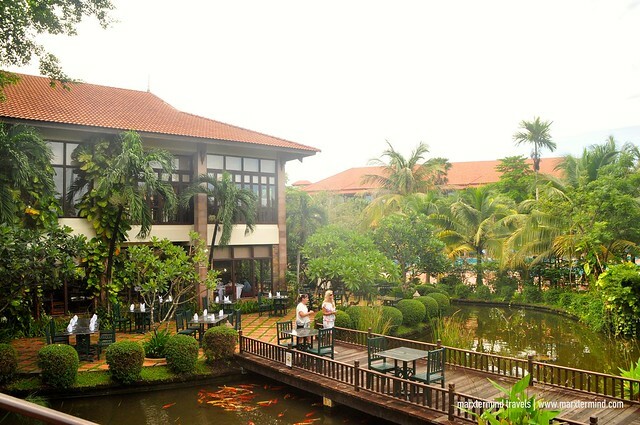 The resort offers three types of accommodation. They have rooms, suites and villas. I stayed in a Premier Deluxe Room. Check room rates and availability here. It was spacious. I was surprised to see. In fact, it was the first thing I noticed when I entered the room. It was too big for me but not complaining. 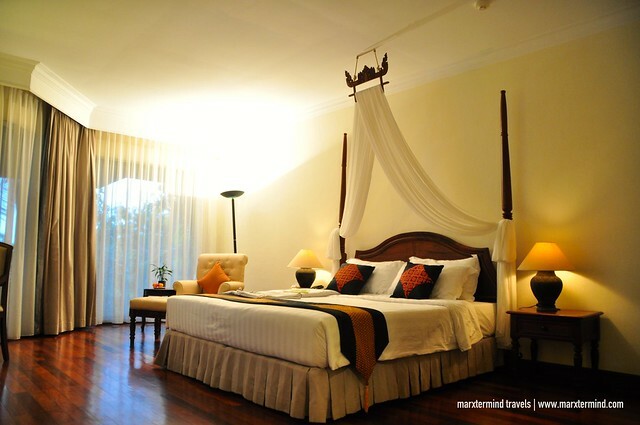 The room features a classic yet stylish ambiance and décor. The room is air-conditioned. It has a king bed and excellent in-room amenities. 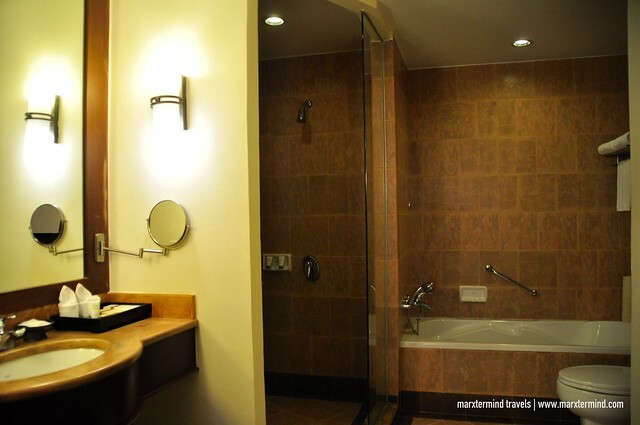 It also has a huge bathroom with separate shower and bath. I love the room. It is also equipped with facilities such as cable television, personal in-room safe, telephone, coffee and tea making facilities, mini-bar and writing table. 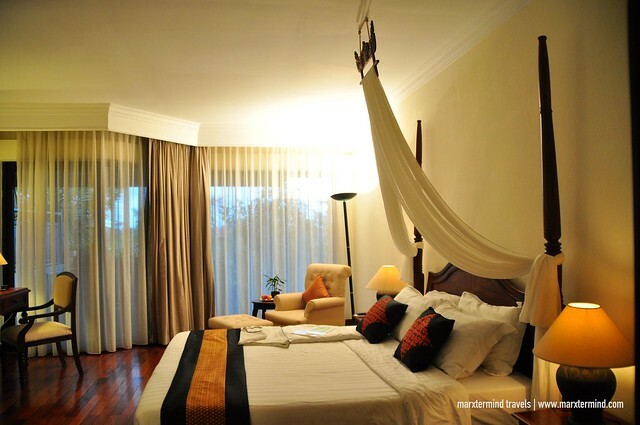 The room also has a balcony that faces the lush green landscape. I generally like the room. It has the comfort and luxury for me to enjoy my stay. It has the great space provided with the best in-room facilities. Not to mention, the soothing king bed. I had restful sleep for three nights. I even wasn’t able to get up early on my last day because I was too lazy. The bed was too cosy. But well I guess that was a good thing because I really had a comfortable stay. Part of the resort that I also enjoyed about was the facilities. 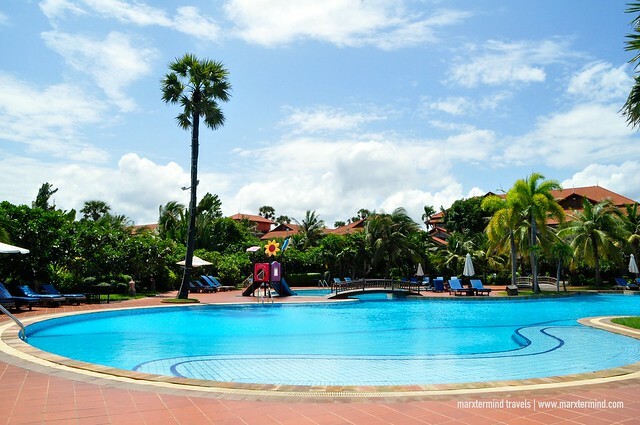 The resort has a range of great facilities that guests can enjoy. 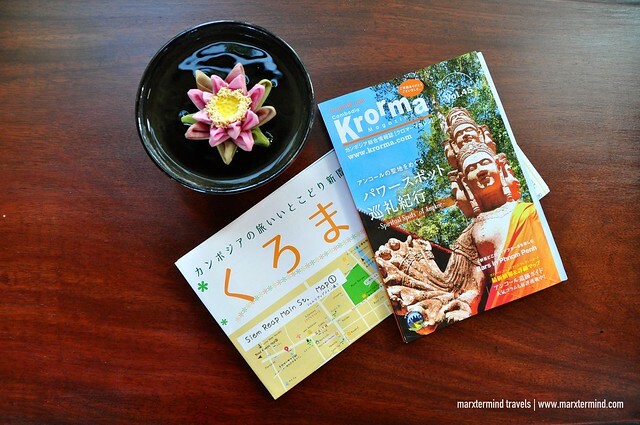 When it comes to dining, there are several restaurants and bars to choose from. But too bad that it was only breakfast buffet that I had able to try. Guests are provided with complimentary buffet breakfast. The selection was plenty consisting of local, Asian and western favourites. Aside from it, the resort also has other amenities that guest can enjoy. They have swimming pools, playground, tennis court, driving range, spa and business centre to name a few. It was on my last day when I experienced the swimming pools. 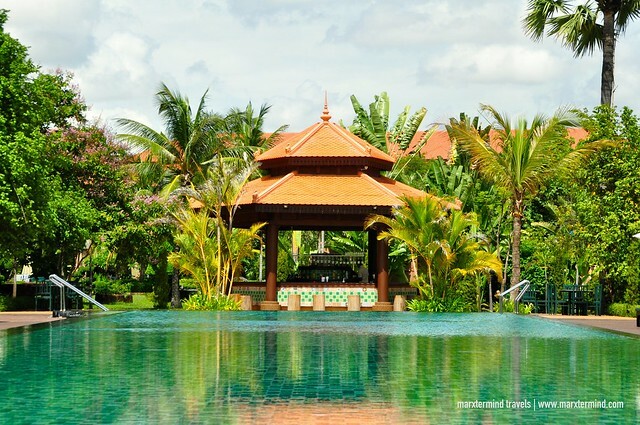 They have two pools; one is a big pool with separate kid pool, Jacuzzis and pool bar while the other one is a smaller pool located in a more secluded part of the resort. It was in the smaller pool that I spent my time the most because there were only fewer guests or sometimes none in here. And it’s also looks lovely. I got a chance to enjoy the pool by myself. It was so relaxing that I actually asked myself why I only went to the pool on my last day when I only left with limited time. The resort also offers several services for guests’ convenience. They have 24-hour front desk, in-room dining, valet services, concierge, airport transfer, babysitting, complimentary Wi-Fi and free shuttle service to downtown. 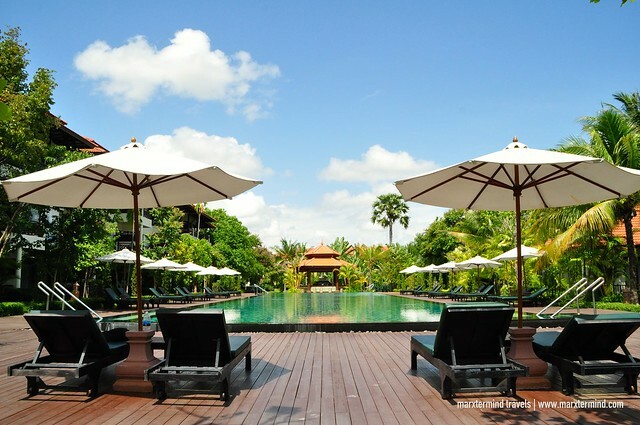 Angkor Palace Resort & Spa is truly a great place to stay while in Siem Reap. With several facilities to enjoy, it didn’t only give me a place to stay but also a place to relax and enjoy my time on this town. It has the comfort, conveniences and luxuries through its well-styled rooms, outstanding facilities, friendly services and beautiful surrounding. 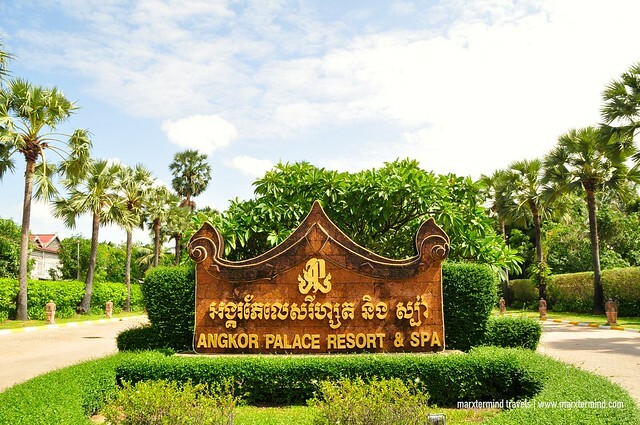 Disclosure: Angkor Palace Resort & Spa hosted my stay for the purpose of reviewing the resort. All notes and opinions are my own.